Road Transport Media has a strong email marketing presence and can easily help you find the right audience to advertise to. Email marketing is a key element in all lead generation campaigns. As well as being a great way to put your advertisements in front of the right audiences, quickly. The right content in front of the right people. All the week’s news from the Commercial motor website. Headlines, upcoming events and links to our A Week in Trucks videos, all inside. If you want to find out more about our products, or get in touch about advertising with us, please make an enquiry. Targeted campaigns designed by you. A great way to advertise your new products. Compliance and legal news from the Commercial Motor website. 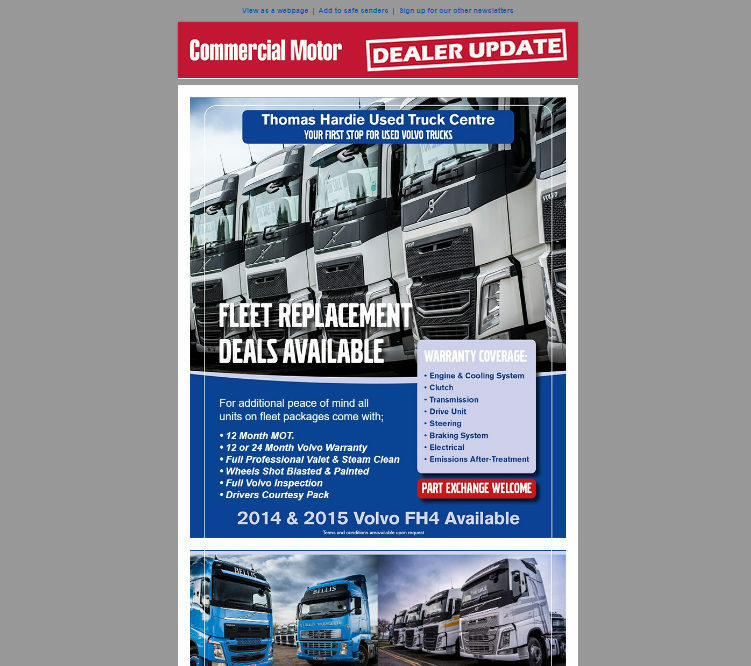 Fortnightly deals with select stock off the Commercial Motor website. A great place to push some of your classified adverts that you list on the Commercial Motor website. The accompanying newsletter to our new sustainability event, it covers new efficient technologies, compliance news, as well as what companies are doing to handle their emissions. News highlights from the Motor Transport website. Motor Transport serves the senior managerial audience and directors, so has news on business acquisitions, contract wins, legislation and company and fleet news. Targeted campaigns designed by you. A great way to advertise your dealership.